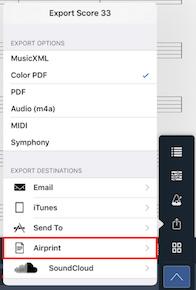 How on earth do you print a score using AirPrint? The help manual on the App refers to an icon that you have to press in order to access the printer menu. I can't find this icon anywhere. I want to print one of my scores but am struggling massively. The Help Manual on the app is very unclear and confusing when it is talking about AirPrint. Please can you tell me how to print my scores as the Printer Menu icon referred to in the Help Manual is not there? We've yet to update most our manual sections for the changes in 4.2 as our menus & toolbars are still undergoing updates, so we apologize for the inconvenience there.